Public pools, gyms, and locker rooms can be very dirty places, no matter how clean they look. These areas are wet, usually warm, and have loads of people walking in and out. They are a germ haven! Bacteria and viruses love to hang out in warm, wet, and dark places...sound familiar. Walking barefoot in these places leaves your feet vulnerable to a slew of problems. 1. Warts- Warts are highly contagious and very easy to spread. You can spread warts easily room person to person within your home so just imagine the risk with the amounts of people coming in and out of your local gym. Once you have warts, they can be very stubborn to treat. They can get so deep in the skin, that it takes multiple treatments to start the breakdown of the wart. 2. Nail fungus- Like warts, nail fungus loves to live in warm, dark and moist environments. Nail fungus also spreads easily and can be very stubborn. It can infect the nail and work it's way all the way down to the toe bed. This means treatment needs to penetrate the nail and treat the underlying skin. Even after successfully treating the nail, you will usually have to wait until the nail grows out to see an improved appearance. 3. Athlete's Foot- Athlete's foot is a fungi that affects the skin. It can cause the skin to become dry, flaky and very itchy. The condition can spread easily from shoe to shoe or by sharing socks. While treatment is usually effective and involves medicated creams more than anything, it can be a very uncomfortable and unsightly problem. Your best offense is a great defense! 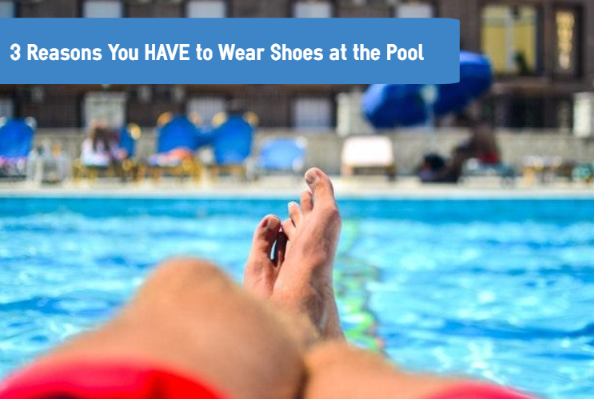 Wearing water shoes or sandals can easily prevent all this trouble! They will even prevent your feet from sun block. This simple tip will keep your feet healthy and safe from some very common and preventable problems.